GAK are proud to be a Shure Centre dealer offering huge stocks of the world class-leading Microphones, Wireless Systems, Headphones & iOS devices. Shure is considered by many to be one of the most popular microphone brands on the market, developing some legendary models including the world renown SM57 and the pretty much indestructible SM58. Shure also boasts one of the most-loved large diaphragm dynamic microphones in existence, the SM7B, used on countless podcasts, talk shows and radio shows for its distinctly warm, bassy 'Broadcast' tone. Shure also develop fantastic Condenser mics and USB microphones amongst others. Shure's wireless systems such as the BLX & GLX range, can be found on countless festival and venue stages, aerobic classrooms and performance spaces around the world. Shure also specialise in a range of headphones from high-end stage monitoring headphones such as the SE Series to audiophile closed cup cans like the SRH Series. Since it's inception back in 1925 by Sidney N. Shure, over the years Shure has become the industry standard when it comes to a vast range of audio gear. 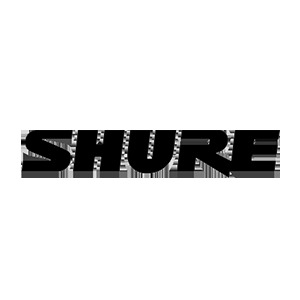 If you have any questions about Shure products, don't hesitate to contact one of our Shure specialists either in our store, using the online live chat or call us on 01273 665 400. A two-way radio microphone ideal for harmonica/blues harp players. Classic UNlDYNE II design coupled with modern acoustic components to meet today's performance standards. A professional Dynamic microphone designed for live vocal use. Wireless dual vocal system featuring two PG58 mics. Reliable for seamless, crystal-clear audio. Side-address mic for detailed studio recording and live sound productions. A flagship in premium, high-level studio performance. The choice for the world's most accomplished vocal performances. Designed for quick, simple and portable use. Premium digital stereo condenser microphone for mobile high-fidelity video and audio recording. For astonishing audio, anywhere. A handheld vocal mic that delivers crystal-clear sound perfect for spoken word and vocals. A handheld vocal microphone with a dynamic capsule and cardioid polar pattern. Wireless freedom across the stage. Sound isolating earphones featuring a dynamic MicroDriver which offers up warm and detailed sound. Sound isolating earphones that feature High definition MicroDrivers to provide full range audio. A top choice for discerning professionals and audiophiles alike. A unidirectional dynamic microphone, perfect for recording musical instruments and vocals. This is the Go-To Microphone for Stage Vocals. Reliable, Affordable and Built to Last. The Shure SM58 is the Go-To Microphone for Stage Vocals. Reliable, Affordable and Built to Last. Dynamic Cardioid unidirectional Microphone perfect for broadcasting, podcasting, as well as studio recordings.